Pictured is a graph illustrateing a comparison of the current to future average response times in Sidney if a third northern fire station is built. SIDNEY — Presentations on 2018 statistics as well as the future of Sidney Fire and Emergency Services was the focus of the majority of Monday’s Sidney City Council meeting. The department’s annual report was presented by Fire Chief Brad Jones. Also, architects Tim Bement, from App Architecture in Englewood, and Rob Manns, from Manns Woodward Studios in Baltimore, gave a master planning update on Sidney Fire Department’s (SFD) future Station No. 3. A story on the proposed Station No. 3 will be published in Friday’s newspaper. The annual report included SFD’s fire prevention activities, training hours, operation activities, significant events, the incident densities and response times by district. A current to future comparison of the average response times was broken down for fire and medical calls, which Jones used to underline the need for after a third fire station. The fire data showed that SFD responded 92 percent of the time in 6.5 minutes to the center portion of Sidney, 88 percent to the west, 30 percent to the contractual areas, and only 62 percent of the time to the north of town. The standard is a 6 minute response time for EMS calls, Jones said. The medical call data for 2018 showed SFD successfully arrived within 6 minutes 89 percent of the time to the center of town, 82 percent to the west, 22 percent to the contractual areas, and less than 50 percent of the time to areas north of Russell Road. Jones’s report on fire prevention activities showed in 2018, the department conducted 646 fire prevention inspections, 13 fire investigations, zero court ordered juvenile fire-setter programs, and 83 pre-K through fifth-grade school education programs to 2,978 young students. In 2018, Sidney Fire received a total number of 4,066 calls for service. There were 472 EMS and 122 fire incidents among the 2018 operations of township activities, Jones said. Among the significant incidents during 2018, he noted the most expensive event last year was a building fire at the Dollar General on Russell Road, which caused $525,000 in damages. The department underwent 6,889 total hours of training in 2018, averaging 186 hours per person. Jones refreshed council that SFD also performs rope, trench, and ice rescues and training, as well as fast water boat rescues and extrication from machinery or automobile crashes. SFD also responds to Haz-Mat, confined space incidents and grain rescues, he said. In other business, Rachel Hale, the new executive director of the Senior Center Sidney-Shelby County, attended and introduced herself to council members, upon the suggestion of Council member Janet Born. During staff comments, Parks and Recreation Director Duane Gaier informed council he recently received a $4,000 check donation from FISH for Sidney’s summer Back Pack program. Last year the program sent home 2,163 meals to feed area youth. Each weekend during the summer, each participating child was sent home with two meals in their backpacks for Saturday and Sunday. City Manager Mark Cundiff reminded the public city offices will be closed on Monday for Presidents’ Day. He noted, however, there will not be a trash delay next week. Cundiff also shared that Sunset Development informed the city of its intent to move forward with affordable, R-2, duplex or single-family dwellings in the area. Last month council denied the developers request to rezone a parcel of land on Wapakoneta Avenue from an R-1 to an R-3, multi-family residential district. Cundiff noted approval from council is no longer necessary for Sunset’s project. Council also went into an executive session to consider the purchase of property for public purposes and the sale of or other disposition of unneeded public property. No action was taken by council when they emerged from the session. 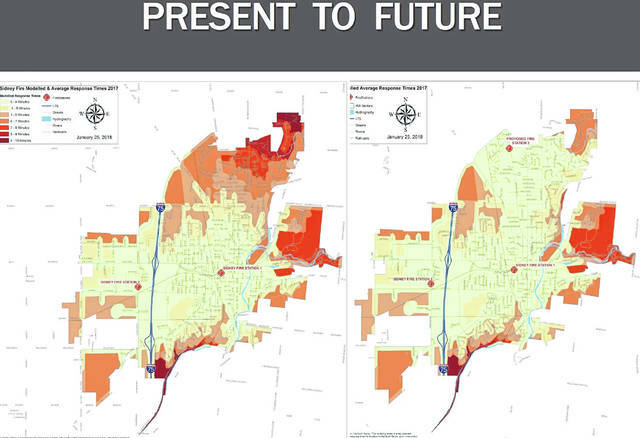 https://www.sidneydailynews.com/wp-content/uploads/sites/47/2019/02/web1_present-to-future.jpgPictured is a graph illustrateing a comparison of the current to future average response times in Sidney if a third northern fire station is built.